Maybe I should start at the beginning – well when I first came to live with Margaret and David. They rescued me and at first I was very scared and kept trying to hide in boxes, behind furniture and even on the top of wardrobes and tall cupboards. Now I’m very much at home and love living here. There are lots of nice things and best of all lots of mice in the garden. Mice are Nice, but M & D don’t think so – they say Do Not Bring Mice Into the House – that’s not a Good Thing to do. I don’t really agree. It’s great fun to bring them in and let them run around whilst I stalk them and play with them. Sometimes they won’t play and go very still – and then I can eat them – they’re very tasty. M & D had a lot of trouble with Mice in the House before I came. They got under the floors and nibble at the lagging on the water pipes and even gnawed the pipes and made holes. The water came out, which no doubt the Mice liked – but then the boiler stopped working and M & D had no hot water and no nice warm radiators. That’s enough for today. Maybe Margaret will let me write more Cat-Logs sometime and I can tell you some more. She says this cat-post is just right for Saturday Snapshots run by Melinda – you can see more on her blog West Metro Mommy Reads. Whilst we were staying in the Lake District a few weeks ago we drove through the Honister Pass, one of the highest passes in Cumbria. It connects the Buttermere Valley with the eastern end of Borrowdale Valley. There is a slate mine but we didn’t have time to take a tour – just enough time for a quick drink and a look round the cafe/shop/showroom and stone garden. Last Saturday I wrote about our trip on Ullswater on a grey, overcast morning, a couple of weeks ago. That same day the the sky cleared, and the sun shone as we went to see Aira Force, below Gowbarrow Fell above the shores of Ullswater. You wouldn’t have thought it was the same day, as the extra layers of clothing had to come off! The shore of Ullswater is famous as the place that inspired Wordsworth to write his poem ‘I wandered lonely as a cloud‘, after a lakeshore walk in 1802, and it’s also where Donald Campbell broke the world water speed record on 23 July 1955 in the jet powered Bluebird K7. The lake is a ribbon lake formed after the last ice age, sculpted by three separate glaciers. There were no speed boats on the lake, they’re banned now, and the season for daffodils was over on the dull, cloudy morning when we went on a ‘steamer’ on Ullswater, during our recent holiday in the Lake District. The Ullswater ‘Steamers’ have been sailing on the lake since 1859 and the oldest boat currently still in use is the Lady of the Lake, built in 1877, believed to be the oldest working passenger vessel in the world. It was in steam until the 1930s and it was the boat we boarded for our trip down the length of the lake and back again. Even though the weather wasn’t very good it wasn’t raining and we had a pleasant trip with views of both sides of the lake and the mountains . Stone circles are amongst the most tangible and durable connections to the past. They have fascinated me ever since I was a young teenager and saw Stonehenge. We were on our way to Girl Guide camp in the New Forest, travelling overnight by coach from Cheshire and reached Stonehenge just before dawn. I was just about awake as we scrambled down from the coach and made our way over the field to be at Stonehenge as the sun came up. It was magical. We were the only people there and in those days Stonehenge was fully accessible. I’ve been there since, and seen it on TV but I am so glad I had that experience before full access to Stonehenge was available, before there was a carpark and a visitor centre, shop and cafe. Now you can only view the stones from a short distance away along a tarmac pathway – after you’ve planned your visit in advance, parked your car and been driven 10 minutes by a shuttle bus, because entry to Stonehenge is by timed tickets. (Access is free at the solstices.) I understand the need for all this but it still makes me shudder. When I discovered that there is a stone circle near Keswick I was keen to go there whilst we were staying in the Lake District last week. Although there were more people at Castlerigg Stone Circle than I would have liked I really did appreciate the informality of the site. There are no restrictions and you can wander around the stones as much you like. I suppose you’d have to get there at dawn or at least a lot earlier than we did to be there on your own. Castlerigg is set on a plateau near Keswick, surrounded by hills, including Skiddaw and Blencathra. There is no carpark, visitor centre or shop – and I hope it stays that way. You can park in a little lane, where there was an ice-cream van selling delicious home-made ice-cream on the day we were there. Stone circles are ancient monuments. There are over 50 stone circles in the Lake District, made with locally available stones. Nobody knows what their function was, although there is much debate about whether they had a ritual and religious use, an astronomical significance or an economic function. As you can see that the stones vary in size. The tallest stone is 2.3 metres and the largest weighs about 16 tonnes. 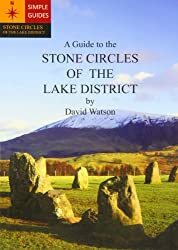 Castlerigg Stone Circle is described A Guide to the Stone Circles of the Lake District by David Watson, published in 2009 with colour photographs, maps and directions to the sites. The cover photo shows Castlerigg Stone Circle.